Platinum 100% Iso-Whey is so pure, that the formula mixes instantly in a shaker cup or even in a glass using a spoon. 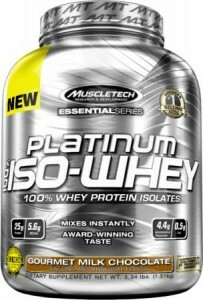 And just as important as quality and purity of the whey protein in Platinum 100% Iso-Whey, is its taste. We conducted third-party taste tests on real consumers to help us formulate a first-in-class taste profile that's second to none. 1. Burke et al., 2001. International Journal of Sports Nutrition and Exercise Metabolism. 11(3):349-64. Immunoglobulins - These fractions are rich in the amino acid glutamine, which can support muscle recovery in response to strenuous training. Bovine serum albumin - This fraction is a large-sized globular protein with a good profile of essential amino acids that are important for muscle growth support. If you have any question, just leave your message and let us know.